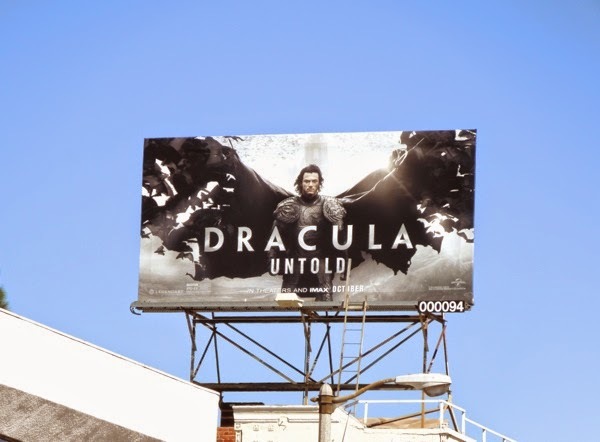 Just when you thought you knew everything about the ancient Transylvanian vampire, along comes an origin story called Dracula Untold to fill in the blanks. 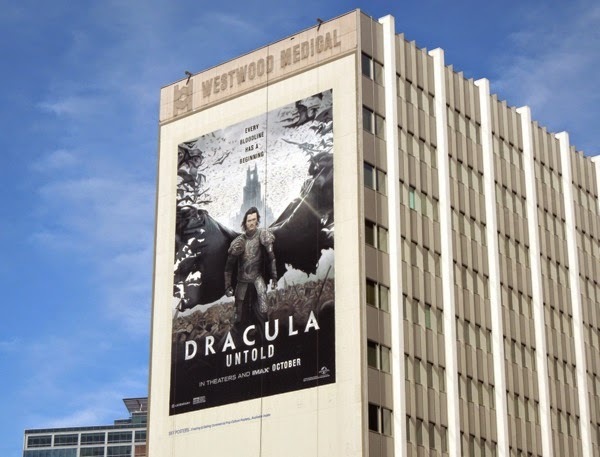 He's played 'Aramis' of The Three Musketeers, he's been 'Zeus', the Father of the Greek Pantheon of gods in Immortals and starred in The Hobbit Trilogy, so Luke Evans is no stranger to the worlds of historical movies and fantasy, but this time the Welsh actor takes on the iconic lord of darkness himself. 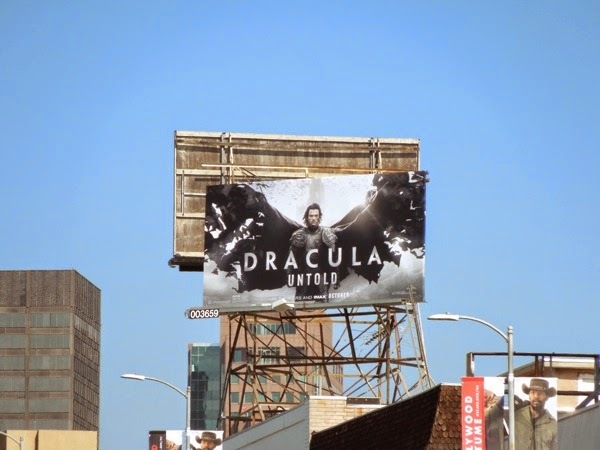 And from the looks of these dramatic billboards he's channeling The Dark Knight with all those bats creating his supernatural cape. 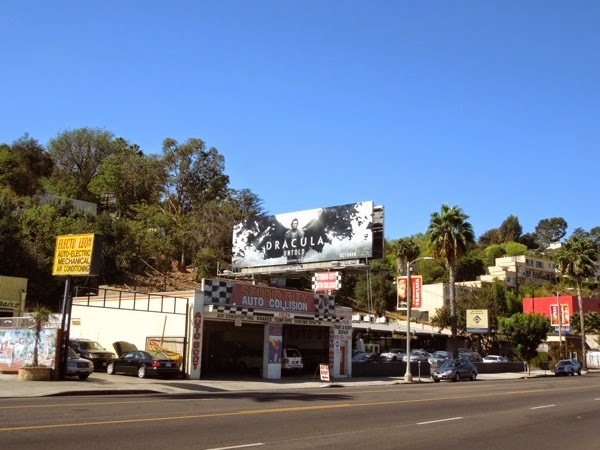 The film directed by Gary Shore explores the origin of Dracula and weaves vampire mythology with the real-life history of 'Vlad the Impaler', recreating him as tragic, flawed hero in a dark age of war and magic. 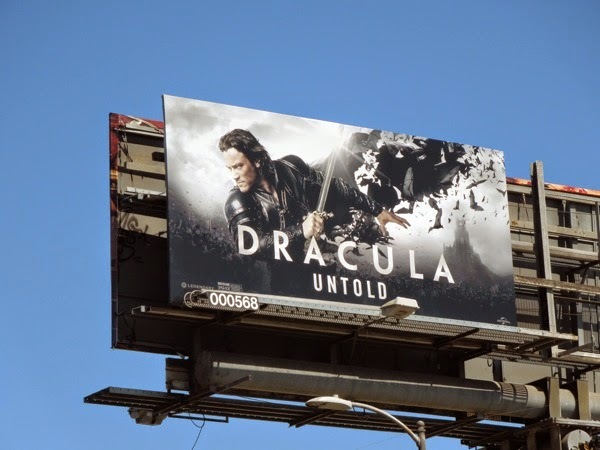 Dracula Untold is also rumoured to be the start of a shared cinematic universe reboot, similar to Marvel Studios, featuring all of the Universal Monsters, like The Mummy, The Wolfman, Frankenstein's Monster, the Creature from the Black Lagoon and even The Invisible Man. 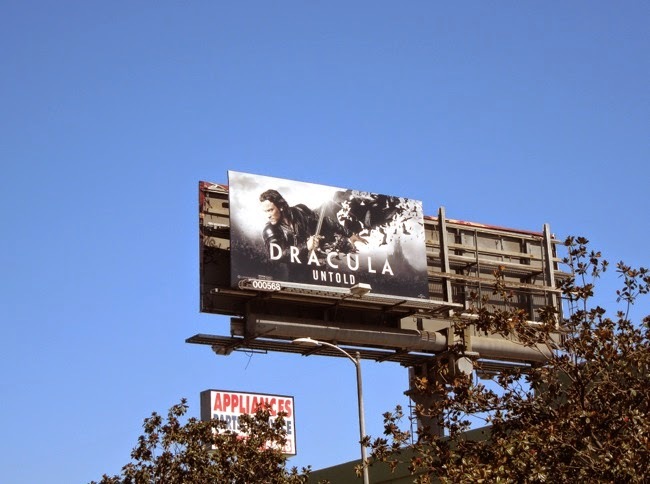 Are audiences ready for yet another retelling of these classic horror monsters, or has their desire for vampires and their ilk been sated in recent years by movies like The Twilight Saga and the Underworld film franchise, and TV shows like True Blood, The Vampire Diaries, Penny Dreadful and Buffy the Vampire Slayer. 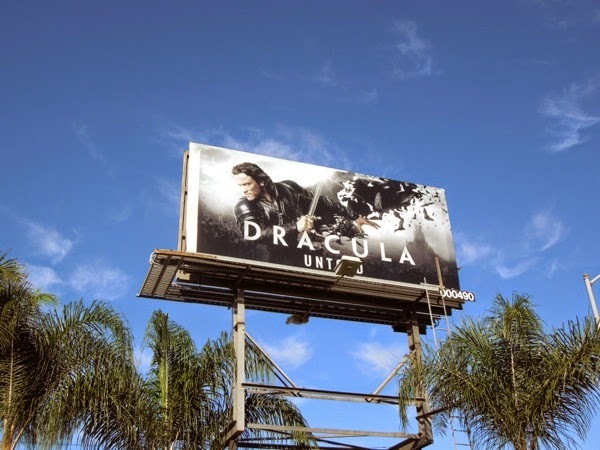 NBC's recent Dracula series didn't survive more than a season with Jonathan Rhys Meyers as the fanged legend, so should these monsters be left to rest in their crypts for a bit longer? 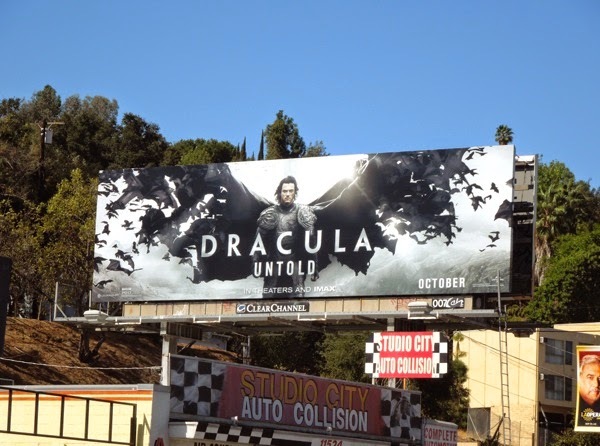 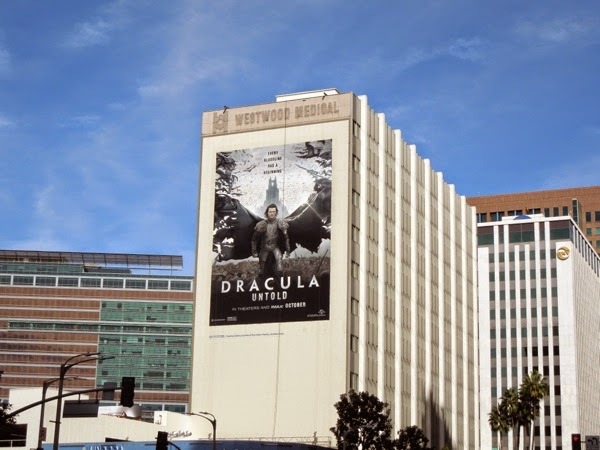 This giant-sized billboard for Dracula Untold was first spotted along Wilshire Boulevard in Westwood on September 30, whilst the standard landscape billboard was first spied along Ventura Boulevard in Studio City on September 18, and later along Sunset Boulevard. 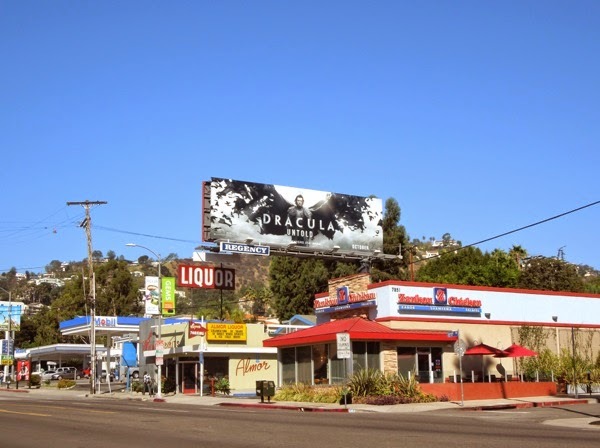 The smaller ad creatives were snapped along Westwood Boulevard, Highland Avenue and Fountain Avenue from September 22 to October 5, 2014. 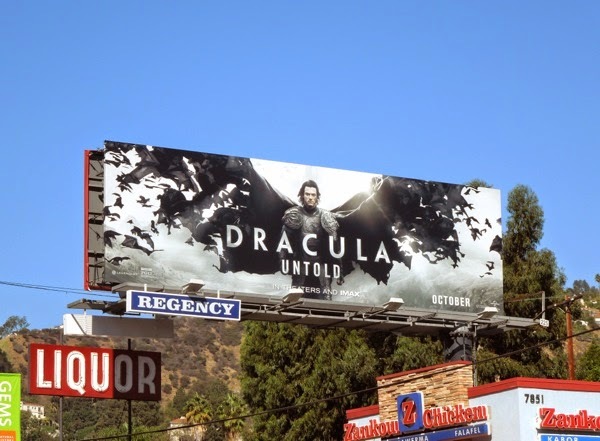 Only time with tell if this version of Dracula can take a big enough bite out of the Fall box office. 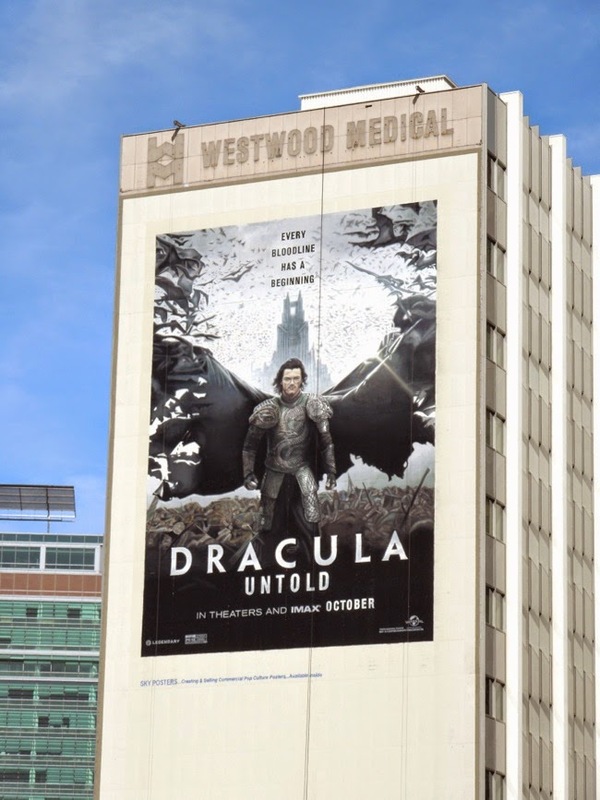 Stay tuned over the next six days for another MOVIE WEEK here at Daily Billboard, showcasing all the forthcoming film outdoor ad campaigns filling the skies of L.A. at the moment.